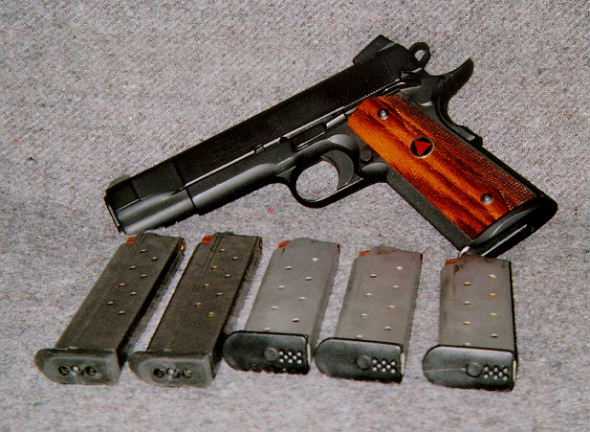 On the premise that 98% of all feeding problems in a 1911 pistol - whether stock or custom - are magazine-related, I obtained for personal use several 10mm mags from Tripp Research and Metalform. Truthfully, I've never been totally satisfied with the reliability of my CMC 9-rd mags, though my Colt factory 8-rd mags, using Wolff XP springs, have always been flawless performers. But why should the owner of a 10mm 1911 be "stuck" with a mere 8 rds (or 8+1) when most mags for .45 models now sold have that capacity too? In the first place, quite apart from the 10mm's substantial power advantage over the 9mm and .45acp, one of the original promises of this cartridge was a significant increase in capacity over the fatter .45 slug, in a pistol of essentially the same size and weight. Moreover, in the case of my Delta Elite, a Victor Tibbets custom piece, the Smith & Alexander magazine well makes mandatory some type of base pad in order to fully seat the mag, especially when reloading under stress. My Colt mags came sans base pads. Wilson, apparently, can't stand the 10mm cartridge and refuses to make mags in this caliber anymore. And some of my CMCs have been, well, iffy. So Tripp's 9-rd 10mm Cobra mags peaked my interest once they were available. Metalform recently announced the availability of its 10-rd 10mm mags, and on the various gun boards they've been the subjects of discussion and group purchases. I picked up two on my own for range testing and inclusion in this review. Pictures of the Cobra and Metalform mags follow the text below. Tripp's 9-round 10mm Cobra Mags. Virgil Tripp is well known for his hard chrome work on firearms, formerly operating a metal refinishing business. He's phased out the refinishing work as far as I know, and now produces a line of high-grade 1911 magazines. I ordered three 10mm Cobra mags, at $44.00 per mag. They were shipped promptly, arriving three days after placing my order. The mags came individually packaged in clear plastic boxes, with the caliber and capacity highlighted on the box. Cobra mags are offered in 9mm, .38Super, .40S&W, 10mm and .45acp. Slightly below this is the CobraMag insignia. While Tripp does sell a 10-rd 10mm mag, my immediate need was for several reliable 9-rd mags suitable for CCW or duty use. The Cobra mags I received are definitely well made. Calling the tolerances tight is understating it. The bodies appear to be a high-grade stainless steel, with the metal finished in a brushed matte gray. No shiny look here. In a side-by-side comparison of the body of a CMC with the Cobra's, I found the Cobra's length to be almost half an inch longer than the CMC, which means that a cartridge resting in the Cobra mag will sit higher in the gun with the slide back. As well, the feed lip design aids in keeping the bullet high and "nose up." The Cobra's metal walls also appear slightly thicker than the CMC's. The Cobra's follower is a hard black plastic unit that differs from others I've examined. The follower incorporates a supporting metal piece that curves around the front, just below where the bullet's nose would sit. It's almost like a blast shield and no doubt operates similarly to prevent wear or breakage from high-pressure cartridges. The top is grooved nicely to cradle the cartridges as they come up inside the body. The springs are very strong. In the first several loadings of each mag I struggled to get the 9th cartridge in. The good news is that subsequent loadings became easier. Once loaded with 9 rounds, each mag was then tested in the Delta for "fit" and ejection prior to firing at the range. I did this with the slide forward as well as locked back, slapping the mags in and then testing for positive ejection. All three Cobras locked in tight. Two ejected rapidly when the release button was hit. One showed a bit of "stickiness," needing to be pulled out even while depressing the release button. I found, however, that pushing the release and simultaneously touching the bottom front of the pad with my finger prompted quick ejection. 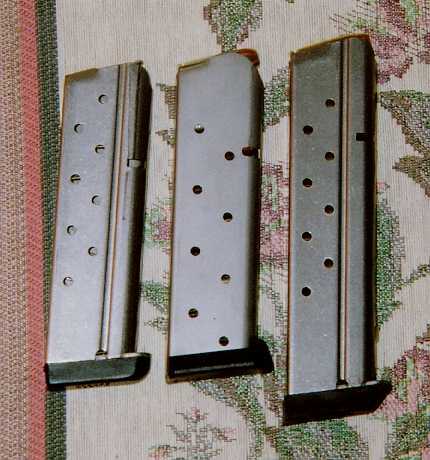 The mag release notch, inside the chute, appeared lined up correctly with the cutout on the mag, and engaged it fully, so the problem was puzzling. But before declaring it a "bad" mag I wanted to see how it performed at the range. 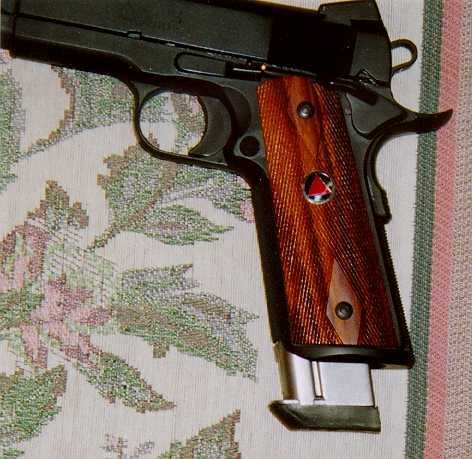 Each Cobra was also tested for positive slide lever engagement. With the mags loaded, I hand-cycled cartridges through the Delta. All fed fine and ejected with no hang-ups, and there were no failures to lock the slide back after the last round ejected. In designing the Cobra's base pad, Tripp kept in mind the geometry of aftermarket magazine wells seen with increasing frequency these days - in particular the S&A unit. The comparative photos below illustrate the shape of the Cobra's pad better than I can describe it here. Wide across the bottom, the sides of the pad bevel up and inward at something like a 50-degree angle. This matches up perfectly with the interior angles of the S&A unit. Seen from the bottom, the pad appears to "fill up" the well. When your hand inserts a Cobra mag into the gun's chute, that wide pad gives a more balanced feel than does a narrow one. Cleaning the Cobras is a breeze. The base pad is removed by depressing a small tab and then sliding the pad forward off the body. The spring and follower come out easily. At the range, fifty rounds of factory 10mm ammo were fired through each Cobra mag, using both HPs and FMJs. Energy levels of the ammo ranged from moderate 200gn Blazers to the hotter Double Tap Golden Sabers and Texas Ammo 200gn XTP loads. Happily, there were no failures to feed or any other bobbles. Slide lock-back and rapid ejection occurred with all 3 Cobra mags - including the sticky one. Apparently, whatever tightness caused this mag's initial reluctance to eject was cured during repeated insertion, ejection, firing and loading, somewhat like a brief break-in period on a new pistol. Of course, 50 rds is no guarantee of anything, but the mag has since continued working perfectly. Like the other two, it ejects rapidly when the release is hit. There's been some talk on the 1911 boards about the Cobra mag hitting the underside of the ejector in some guns because it sits so high in the chute. I did observe a slight bit of shine on the bottom of my ejector, where the rear edge of the Cobra contacts it. Tolerances are such that the amount of contact probably differs from gun to gun. On mine, you have to push up quite hard for there to be any noticeable contact with the underside of the ejector. Even then, it's only the back edge of the mag that grazes the ejector's bottom-front surface, which is where the shiny spot appears. I'll keep an eye on it, but for now I'm not worried about it. (As always, your mileage may vary). As far as fit, finish and function, however, Tripp's Cobra mags are state-of-the-art products. Regardless of caliber, they're a great compliment for any 1911 that's a serious carry piece. For the owner of a 10mm 1911, the Cobra mag provides reliable functioning along with a 9-rd capacity in a flush-fitting package. Thus far, all of my Cobra mags have proven reliable, which has not been the case with my CMCs. (I have not examined Metalform's 9-rd 10mm mag and have no opinion on them). At $44 a pop, the Cobras are pricey compared to other 1911 mags. But if you're going to spend the kind of money it takes to get a custom piece from a talented pistolsmith, or even a high-end factory 1911, why go cheap on the mags to feed it? If I'd kept my Delta stock, or nearly so, with only minimal custom work and no mag well, I would likely stick with the Colt mags, which have run problem-free. But a 10 round capacity is hard to resist in a slim packing single-stack 10mm gun, so I'd probably order a couple of the Cobras anyway. Metalform's Extended 10-rd 10mm Mags. These 10-rd magazines, with base pads, cost $34.82 each. I bought two. 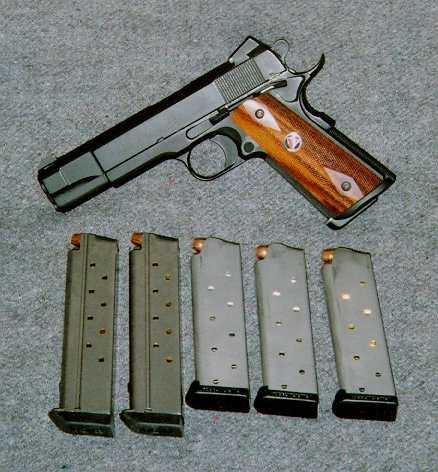 In my view the utility of extended mags for 1911s is limited to "gamer" events - IPSC, IPDA, Postal Matches, etc. - or for range use. The 10-rd Metalform extends a full 1-inch below the bottom of the S&A unit on my Delta. That would drop it about 1.25" below the frame of a 1911 without a similar mag well. This extra length obviates its practicality for CCW, in my opinion. I suppose one could argue that extended mags are an advantage in "tactical" situations, but if there's any forewarning about such an event, I'd access a long gun first, not an extended mag holding a couple more rounds. The Metalform 10-rounders arrived about a week after ordering them, packaged loose in a large shipping envelope. Metalform thoughtfully included a 2004 "Order Form & Price List," essentially a brochure for their magazines. It contains product information on all their 1911 mags, including calibers, capacities, and pictures. As far as I could tell, "bumper" pads are optional for just about any mag they sell, except the officers models. Where Wolff springs are used, this too is specified in the brochure. The stainless body of the extended 10-rounder mag is identical to the bodies of the CMC and Colt factory mags, just longer. The Metalform's stainless steel follower is the same nicely rounded type used in the Colt mags. According to the brochure, the springs used are apparently not Wolff's, since this is not indicated. The base pad is hard rubber, but otherwise identical in shape to the bulky plastic unit seen on CMC mags. It also attaches the same way, via two screws driven up into the floor plate. Metalform's 10-rounders loaded up easily. The springs were strong, despite not being Wolff's, but there was no struggling to get the 10th cartridge in. The 10-rounders fit into my Delta smoothly and locked into place firmly. They also ejected rapidly, with no stickiness or hang-ups. On the lower portion of the front of the mag body, a metal tab or "lip" protrudes. During a reload with the slide locked back, it is designed to catch the edge of the frame and prevent over-insertion. Obviously over-insertion isn't a problem when the slide is forward into battery. But with the slide back I can see how it might happen while rushing to reload, when your mind is fixated on something else, like beating the clock or finding the next target in competition. With the slide locked back, I tested the mags in my Delta - carefully - not wanting to bang up the edge of the frame or damage the ejector. When the slide is locked-back, be advised that this tab will contact the pistol's frame with as much force as you apply in slapping up on the base pad. Again, this is what stops the mag from over-traveling up inside the chute and hitting the ejector. And it does work. But if somehow this tab ever wore off and the mag overshot the release notch during an energetic reload, only the underside of the ejector would stop the mag - but the result would likely be a damaged, if not broken, ejector. That said, the performance of the 10-rounders was impressive. As with the Cobra mags, 50-rds of factory ammo were loaded and fired from each mag at the range. I encountered no problems whatsoever. Whether loading up 10-rds and then chambering the first cartridge from the mag (9+1) or "topping off" the first round using another mag and then inserting a loaded 10-rounder (10+1), there were no failures to feed, extract or eject with a variety of HP and FMJ loads. Notwithstanding the limited uses for extended 1911 mags generally, I can certainly recommend Metalform's 10-rounders to 10mm fans who might need them. Hopefully, the pictures below will provide some idea of the relative shape, size and fit of the Cobra and Metalform mags. 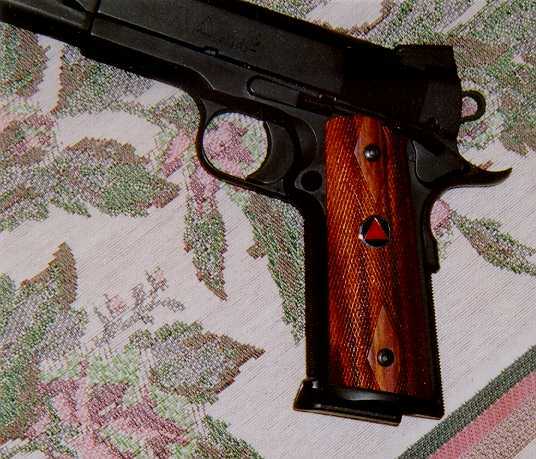 Vic Tibbets customized Delta Elite shown with five 10mm mags. L-to-R: two 10-rounders from Metalform and three 9-rd Cobra mags from Tripp Research. Mag in gun is CMC mag with Wilson rubber base pad. Another view showing the base pads used by each company. Picture shows comparative sizes. L-to-R: 9-rd CMC mag (empty); 9-rd Cobra mag (loaded); 10-rd Metalform mag (loaded). 10-rd Metalform mag, loaded and fully inserted in Delta. Note how far below the bottom of S&A mag well this mag extends. 9-rd Cobra mag, loaded and fully inserted in Delta. Bottom view. Two photos of two different mags in Delta. Top photo shows Delta with CMC mag which uses narrow Wilson-style base pad. Bottom photo shows Delta with Cobra mag. Note how the Cobra's wider base pad "fills" the S&A mag well.